Fifty actors, more than 1,000 costume items, and immeasurable excitement. This will be the 42nd year that our Costume Shop crew has crafted the onstage kaleidoscope of colors, patterns, and textures that is A.C.T. 's Christmas Carol, and the process is well underway. 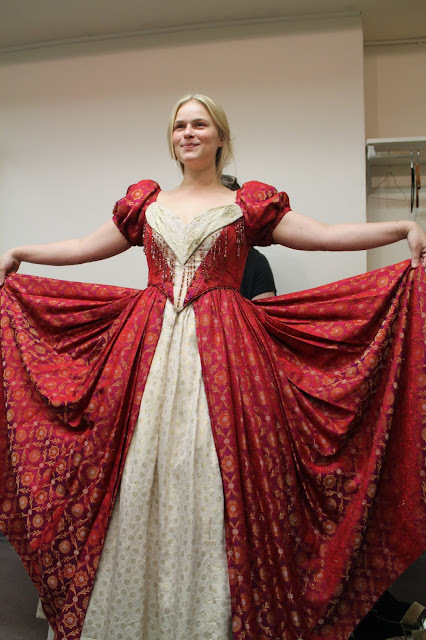 Over the last few weeks, each actor has visited our Costume Shop for a personal fitting. 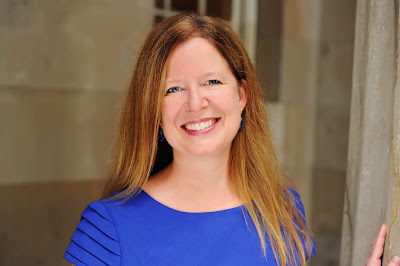 Build Manager/Draper Keely Weiman helps third-year M.F.A. 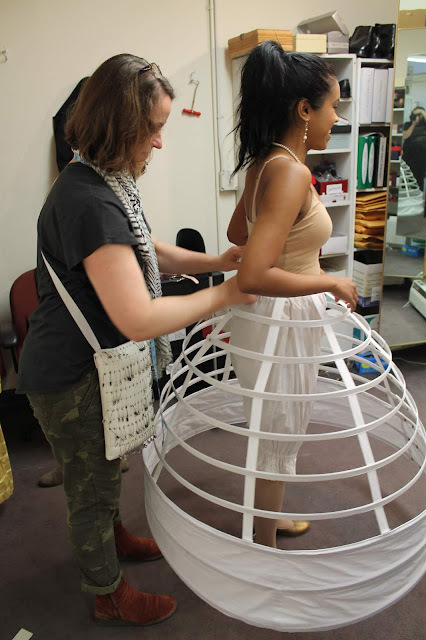 actor Avanthika Srinivasan adjust her hoop skirt. Photo by Elspeth Sweatman. Actors may have begun developing their character psychologically, but with the addition of a costume, they get a sense of how their character feels physically. 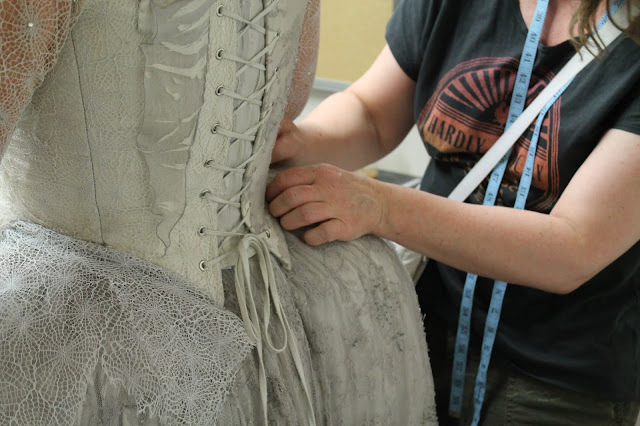 From dainty earrings to the intricate texture of the Ghost of Christmas Past’s sleeves, our costume shop crew makes sure everything fits perfectly and that the actors have the range of motion needed to portray their character. Build Manager/Draper Keely Weiman laces the Ghost of Christmas Past's corset. Photo by Annie Sears. The duration of each fitting ranges from 30 to 90 minutes, depending on the actor’s number of costume changes. 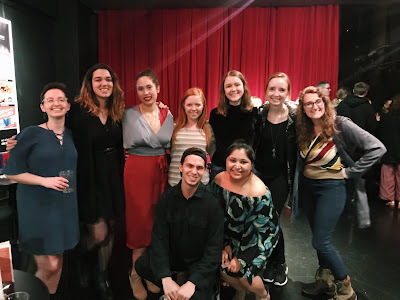 Some actors, such as third-year M.F.A. student Jerrie R. Johnson, will wear four entirely different costumes in a single performance. Costume Director Jessie Amoroso helps Jerrie R. Johnson put on a ring to complete her Belle look. “I usually let them take me out to dinner first!” joked Johnson. Photo by Annie Sears. 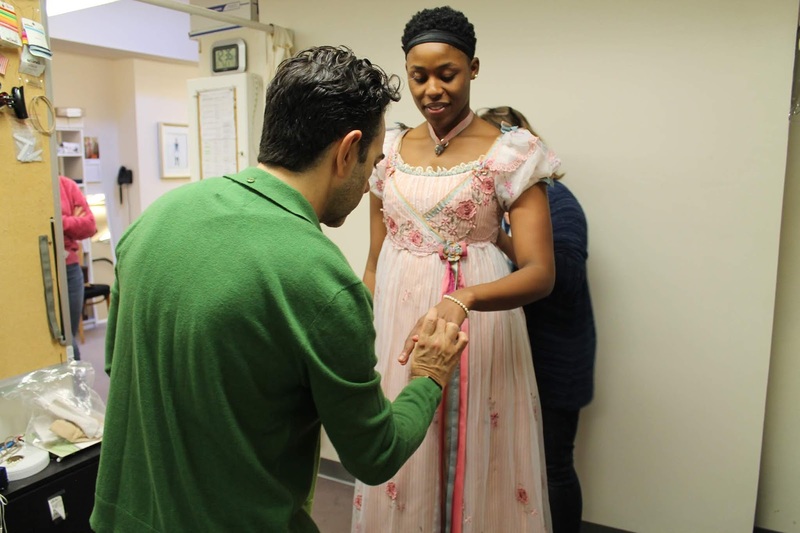 With a 50-person cast at an average of 45 minutes a session, our costumers spend nearly 40 hours on fittings alone. That’s just the preparation. Then the costumers make the alterations, sew name labels into each costume, and repair anything that goes amiss during the run. Third-year M.F.A. actor Belle Aykroyd admires her party dress. Photo by Annie Sears.